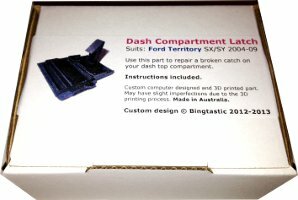 3D Printed Latch to Fix Ford Territory 2004 – 2011 SX SY SYII Dash Compartment Catch Clip Repair – with 12 months warranty – Bingtastic! Over 1,500 sold since 2012! 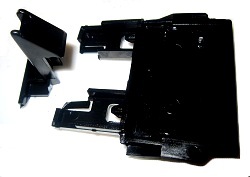 This part fixes all Ford Territory models with a compartment on the top of the dash 2004-2011 (TX, TS, Ghia, SX, SY, SYII). Fits every Territory sold in Australia or New Zealand with a second glove box on top of the dashboard. 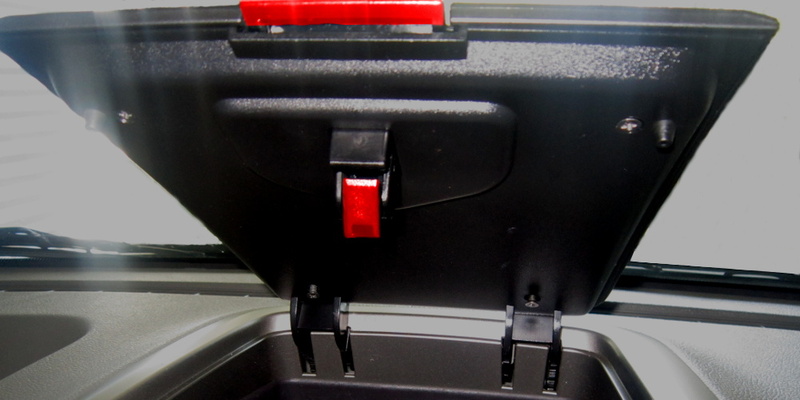 If your Territory has a compartment on the top of the dash with a broken latch, this is the part you need to fix it. Ford want to charge you over $500! The latch broke on our Ford Territory 2 days after we bought it in 2012. I was shocked Ford wanted to charge me over $500. So instead, I pulled the latch apart, found the broken bit, and then designed and 3D printed an improved replacement. We’ve 3D printed and sold over 1,500 since then. Ford want you to replace the whole compartment for $500 plus fitting. Why is this part broken in so many Territories? Because the method of manufacture (injection moulding) requires holes in the part for support pins to hold the mould in place for the overhanging bits. 3D printing doesn’t need holes. So we have solved the problem. Made in Australia. Better than the original. We made it stronger. Extra reinforcing around the hook part. We removed the holes near the hook as well. We left a couple of small holes in it to allow you to easily locate the springs, and because it’s 3D printed, it has just a little bit of inbuilt flexibility so it can bend instead of break. This is a custom designed, 3D printed part (made in Brisbane, Australia) that you can use to easily repair your latch instead of replacing the whole dash compartment lid! When you buy this you are getting an Australian designed and manufactured product, as well as supporting a small family business, and encouraging a bit of Aussie ingenuity. Thanks! Dozens in stock. Shipped same or next business day. Includes instructions and a Tax Invoice. New Zealand: Standard Air Mail (3 Weeks) or Express Air Mail (3 days). Rest of the World: Standard Air Mail. To check postage options, add this item to your cart, click “Calculate Shipping”, and select your country. We only sell one part. All Ford Territories with a compartment on the top of the dash use the same latch. When it breaks the compartment won’t stay closed. You end up with a hook like bit that is usually still in the latch, but loose and disconnected. This is the part that fixes the problem. If for any reason it isn’t the right part, I’ll refund your full purchase price and your postage to send it back to us. We’ve helped over 1,000 Territory owners fix this problem with our 3D printed latch, and we haven’t had a single one of our latches not fit or not fix the problem. Skill level: Easy. See the instruction sheet, or watch me do it in our youtube video. Takes me about 5 minutes (I’ve done a few now), and Mums and Dads tell me it takes them about 10 minutes. If you can replace the batteries in a Thomas the Tank Engine, you can do this. I’ve never had anyone unable to install it. 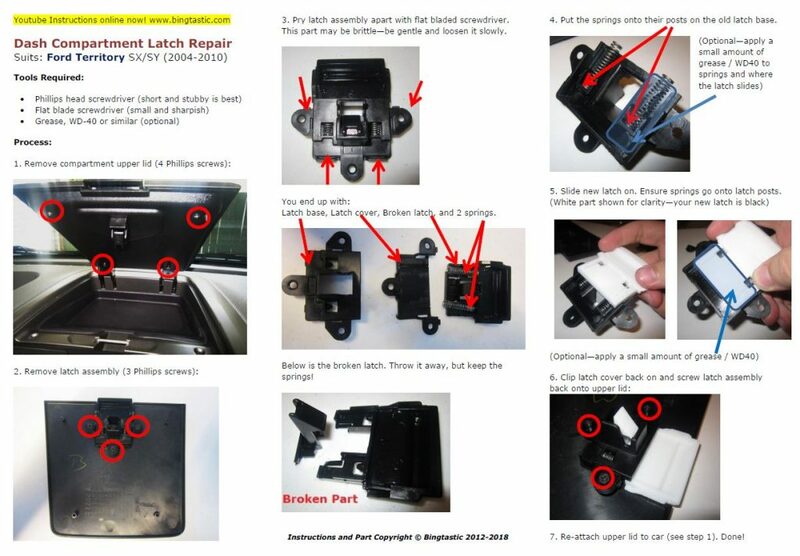 Original parts: You need to keep and re-use all the other parts of the latch assembly: the upper lid, latch cover, latch base, and 2 springs (see instructions). Below is the instruction sheet. Click the image for a larger version. A printed Instruction Sheet is included with the part. White part is shown for clarity below. The part supplied is always black. Less Holes: 3D printing allowed us to remove the holes that cause the breakage in the first place. We kept in a couple of sighting holes that aren’t in the stress area, but removed all the holes that cause the original part to break. Breaking point: I stress tested the part that sticks out and takes all the force, and it holds at least 13kg before it breaks. Repetitive use: It’s definitely kid proof. I have used one in our Territory since 2012. I gave my son the job of testing it to destruction by opening and closing the dash compartment on our Territory dozens of times every day on the way to and from school. After over 1,000 closes the hinges on the back of the compartment finally broke, but not our 3D printed latch. Sun resistant: I’ve had one sitting on top of a water tank in the full Queensland sun since 2012. After 3 years it started to fade slightly, but it’s still very strong. Returns: I’ve sold over 1,500 of these and only had 2 break. Both those were early models, and I tweaked the design and made it even stronger after those two returns. We love our 3D printed latches, and we want you to love yours too. So you get a 12 month guarantee. We will happily refund your money or replace the part if it doesn’t fit, breaks, doesn’t work how you expected it to, doesn’t fix the problem, is too ugly, isn’t what you expected, or if you are in any way unhappy with the part. We will even reimburse reasonable postage costs to return it to us, and if you’d like a replacement we will pay to send the replacement part back to you. We really want you to love this part, so if you have a problem we really want to know about it, and we really want to help. Please get in touch if you have any problems at all. It’s not perfect. The finish is a little rough and textured, and has marks from the support material that held it in place while being printed. We spend a while on each piece cleaning it up, but it’s never going to be as smooth or perfect as the original. It still looks fine, and my wife is very happy with how it looks in our Territory, so it passes the “Mrs” test. And if you think it is too ugly, you can return it for a full refund. I haven’t had anyone take me up on this yet. It’s ABS plastic. ABS is a tough, commercial grade plastic that is found in everything from TV surrounds to car bumpers. This is the same type of plastic most of the original catch was made from, except the facing part, which on the original has a rubberised finish. This replacement does not have a rubberised finish. Slightly flexible. 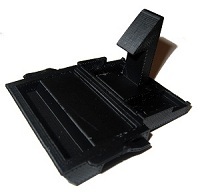 Printed ABS parts are more flexible than injection moulded (factory) parts. The part flexes a little more than the original, but I think this actually makes it less likely to break. My son opened and closed one of these 3D printed latches over 1,000 times without breaking the latch (the hinges on the compartment broke instead). I have also stress tested the hook and it takes more than 13kg of direct force on the hook to snap it off. They’re proving so strong we have only had 2 returns out of over 1,500 sold – and that was years ago and we strengthened the design after those returns. Slightly different dimensions. I had to measure the part and then design it on a computer, so it’s slightly different to the original part. I also reinforced the design to hopefully make it a bit stronger. The printing process has a slight fudge factor as well, so it’s not exactly the same as the original. However, I guarantee the part fits and works for you, or I’ll refund the entire purchase price and your postage to return it to us. Thanks Daniel. The part arrived in Ballarat today and I have just installed it. I tell my friends I am a handyman free zone, but your description made it easy. Arrived within 2 days, easy to install, and much cheaper! Thankyou! Bought the Ford Territory Latch online, received via express post next morning. Easy to install and works perfectly. Thanks heaps Bingtastic! Just fitted my new Ford Territory Top Dash Latch. Piece of cake, and easy instructions to follow! Fits like a glove too. So pleased I didn’t have to spend $300+ for the same part. Wow, fantastic! I searched the Ford links for the centre console lid latch and got nowhere. Then, frustrated, I typed details into Google and there it was straight away. Part ordered, received promptly and installed without any hassles. Maaaaaate, what else can you do with this type of computer technology. Thanks! Bruce. This latch is THE BUSINESS. I ordered last Friday (13th), the part arrived yesterday via overnight satchel (no Aussie Post on weekends) and I fixed it today in under 10mins using the instructions and the youtube video. Absolute gold, son. Very glad I found this.